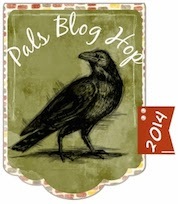 You may just be starting the blog hop or may have come from Beth McCullough's stop #4, Stamping Mom on the Pals Hop. If you get off track at any time, the full lineup below will help you move along from blog to blog so you see all of the amazing creations. There is something for every occasion in the What's Your Type stamp set. Holidays, home decor, backgrounds, modern and retro looks can be created easily and quickly with this versatile stamp set. Don't let it scare you! 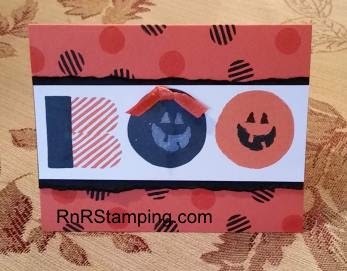 Tangelo Twist and Basic Black were my spooky colors of choice in this card. I started by randomly stamping my background pattern. Aligning the polymer stamps was a snap. I added a bit of Tangelo Twist ribbon and tore the edges of the basic black mat to give it a bit of texture. There is still time to order this set and stamp your stack of Halloween cards. Click on the product names or here to shop my 24/7 online store. The next stop is to see what Lynn Kolcun from Stamping with Avery's Owlery has created for you at stop # 6 on the Pals Blog Hop! Thanks for visiting and I hope to see you next month. Sue, I think your Halloween card is so cute! I have yet to use that stamp set and now I have a reason to ink it up! CUTE! I love that stamp set... think I will be getting it back out again!! Every time I think I don't really need this stamp set, it seems like someone makes something really cute with it! I love your card! Very clever! That was the perfect way to use that stamp set! Boo! is right! I love your creative card! Very clever and your background stamping gave lots of texture ,too. Thanks for joining the Pals color challenge this week! So clever Sue! I never would have thought to use this set in this way. Great job! Thank you for playing with us at Pals Paper Arts for PPA223.